Sodium aluminate is an inorganic chemical that is used as an effective source of aluminium hydroxide for many industrial and technical applications. Pure sodium aluminate (anhydrous) is a white crystalline solid having a formula variously given as NaAlO2, NaAl(OH)4 (hydrated), Na2O·Al2O3, or Na2Al2O4. Commercial sodium aluminate is available as a solution or a solid. Anhydrous sodium aluminate, NaAlO2, contains a three-dimensional framework of corner linked AlO4 tetrahedra. The hydrated form NaAlO2·5/4H2O has layers of AlO4 tetrahedra joined into rings and the layers are held together by sodium ions and water molecules that hydrogen bond to O atoms in the AlO4 tetrahedra. Sodium aluminate is manufactured by the dissolution of- aluminium hydroxide in a caustic soda (NaOH) solution. 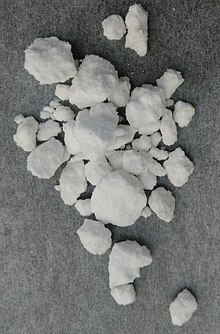 Aluminium hydroxide (gibbsite) can be dissolved in 20–25% aqueous NaOH solution at a temperature near the boiling point. The use of more concentrated NaOH solutions leads to a semi-solid product. The process must be carried out in steam-heated vessels of nickel or steel, and the aluminium hydroxide should be boiled with approximately 50% aqueous caustic soda until a pulp forms. The final mixture has to be poured into a tank and cooled; a solid mass containing about 70% NaAlO2 then forms. After being crushed, this product is dehydrated in a rotary oven. The resulting product contains 90% NaAlO2 and 1% water, together with 1% free NaOH. however the species produced in solution is likely to contain the [Al(OH)4]− ion or perhaps the [Al(H2O)2(OH)4]− ion.